A few clouds. Low 46F. Winds WSW at 5 to 10 mph. When Army combat veteran Jesse Scollin returned from Iraq, he found civilian life slow and even a little dull. One minute he was kicking in doors and dodging bullets; the next, he was a 20-year-old walking with a cane from injuries suffered in a mortar attack. The Louisiana military base where he was stationed upon his return was conveniently surrounded by strip clubs and liquor stores, he said. Eventually, the Army gave Scollin a choice: a military desk job or an honorable medical discharge. The latter was the start of a downward spiral that ended with drugs, alcohol and homelessness. “I’ve been stuck in a bottle for the last four years,” he said. Adjusting to home life after a wartime deployment is a challenge for many military men and women. For some, it goes beyond changes in sleeping patterns and eating habits. They may suffer from post-traumatic stress disorder and various degrees of traumatic brain injuries, as well as feelings of guilt, depression and high stress levels. Activities that were once fun may no longer be enjoyable, said Brian Becker, an outreach coordinator for the Missoula Vet Center. That’s why Xsports4vets, a new nonprofit in Missoula, is regarded by veterans and support groups alike as a smart idea. Spearheaded by Scollin, an avid riverboarder, and Jana Kuntz, an occupational therapist, the five-week grass-roots program teaches Iraq and Afghanistan combat veterans to riverboard as a way to adjust to home life. Beyond that, Scollin prefers not to elaborate on the mission. Not because it’s classified, but it’s not a job he’d recommend to anyone and one he’ll never do again, so he sees no reason to talk about it. “Go watch a war movie,” he tells people. Jesse Roods, a 29-year-old Marine veteran and Scollin’s good friend, described his buddy’s job another way. “That band of brothers thing is for real,” Scollin said. What details Scollin can share about the war are ones he was unable to discuss even six months ago. Roods is there to offer support. But Scollin will not discuss the day he was injured by a mortar. “Buddies died that day,” he said. That was the beginning of years of pain, frustration, medication and rehabilitation. An injury went undiagnosed at the time of the incident. It wasn’t until a four-mile physical training run months later when Scollin’s legs went numb and he collapsed that doctors discovered two herniated discs in his lower back and a crack in his sacrum. After a year of rehabilitation, he was discharged from the military and sought further help from specialists in Oakland, Calif. He attended a local community college in an effort to “try to be normal,” but all of that soon fell apart, and Scollin turned to drugs and alcohol and took to living on the streets. Eventually a friend from Missoula drove to California, picked him up and brought him back to Montana. Meanwhile, Kuntz, a Helena native, was living in Oregon working on a doctorate in occupational therapy from the University of Southern California, studying ways truck drivers could lead healthier lifestyles. She got a call from a woman interested in developing a new center involving ways occupational therapists could help combat veterans adjust to home life. The woman wanted help from Kuntz, who is all too familiar with the topic. Kuntz’s stepbrother, Montana National Guardsman Chris Dana, suffered from PTSD upon returning from a tour in Iraq and, in 2007, after he was discharged for failing to follow orders, committed suicide. 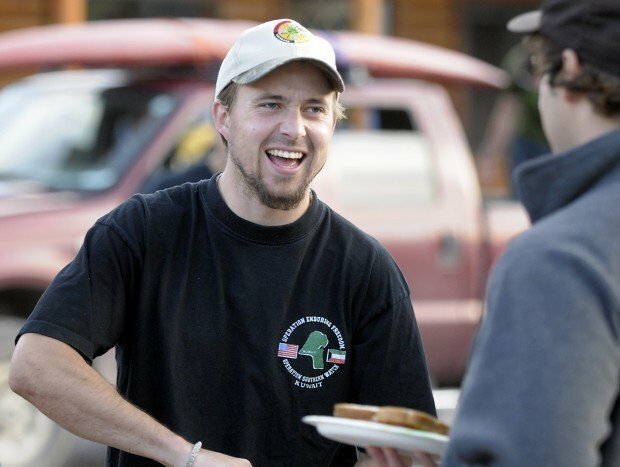 Dana’s older brother Matt, a Helena attorney, began advocating for better screening for post-traumatic stress among combat veterans and is now executive director of the Montana chapter of the National Alliance of Mental Illness. Kuntz, on the other hand, internalized her grief. In an effort to honor her stepbrother, Kuntz agreed to help and began interviewing combat veterans about what helped them adjust to home life. Eventually, she connected with Scollin, whose introduction to riverboarding had been life-changing. Kayaking was out of the question for Scollin. Even twisting to paddle a raft hurt his lower back. Then he found riverboarding. No ride was ever the same. Charging waves twice his size forced Scollin to react quickly. “It puts you at that level in a healthy way,” Roods added. Within no time, Scollin was running the Deschutes River in Oregon and then the Gauley River in West Virginia. “I wanted more,” he said. Xsports4vets is the result of generosity by an entire community. Kuntz moved back to Montana to run Xsports4vets, which held a fundraiser earlier this year at the Badlander, where Shane Clouse and Stomping Ground played for free and local businesses donated items for a raffle, she said. 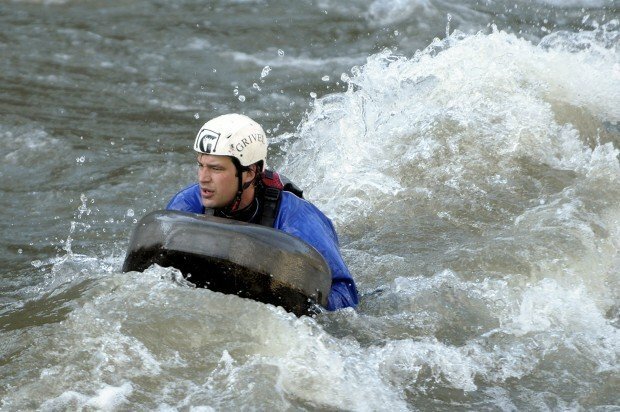 Only a handful of river-guiding outfits in North America – one in Montana – offer riverboarding trips. Montana River Guides out of Alberton agreed to donate all of its services and equipment to make the program possible. Owner Mike Johnston said he was honored to do so. On a recent Wednesday, the river through Alberton Gorge was flowing at 19,000 cubic feet per second – a level at which Johnston doesn’t typically take clients down the river. But these veterans weren’t scared. They understood teamwork and the buddy system better than anyone and were ready for the challenge. Nine veterans from across the state signed up for the program. It’s open to all Iraq and Afghanistan combat veterans. The group meets once a week and carpools out to Alberton Gorge to riverboard, and then circles up around a campfire to share a meal and talk about life. Becker, with the Vet Center, and Kuntz run the discussions. Roods and Scollin said they learn more about themselves and others at each meeting. Besides, Roods said, it allows veterans who don’t like the typical clinical counseling setting to talk about how they’re doing in a more relaxed atmosphere. Ideally, the program will continue, expanding into other extreme sports so it can run year-round, Kuntz said. More money is needed, but organizers are already thinking of ways to incorporate veterans with physical disabilities. Scollin, and the excitement in his voice when he talks about riverboarding, is an example of that. Reporter Chelsi Moy can be reached at 523-5260 or at chelsi.moy@missoulian.com.